In 'Freshwater,' A College Student Learns To Live With Separate Selves Akwaeke Emezi's debut novel follows the spiritually receptive student, Ada. The author pulls from her own experience with what she says "is like a cloud of selves that are shifting." 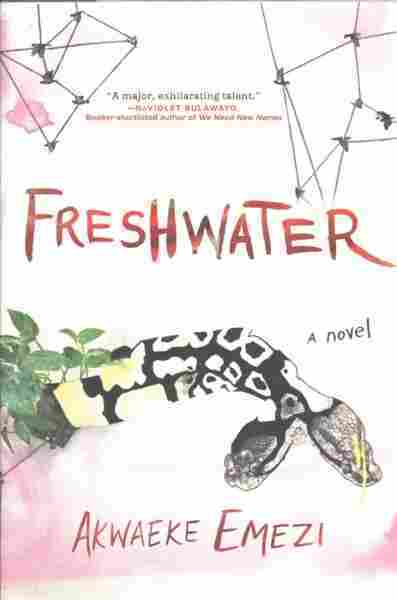 Akwaeke Emezi's debut novel, Freshwater, is the lyrical, nonlinear story of a woman named Ada, born in Nigeria with, as she puts it, "one foot on the other side." Several "selves" exist inside of Ada, and they identify themselves as "we." When Ada comes to America for college, a traumatic event causes the "we" to take over, and Ada struggles to control her own body. The author, who won the 2017 Commonwealth Short Story Prize for Africa, says she pulled from her own experiences. "I wanted to see what it would be like to look at a life through the lens of a different reality — something that was centered more in Igbo spirituality than in Western concepts of mental health, for example. And so, I used my life as the skeleton, chronologically at least." I had tried to make sense of them in different contexts. I was raised Catholic, and so I had tried to make sense of it from a Christian point of view; I had tried to make sense of it from like a mental health point of view. And none of those approaches and none of those lenses really clicked for me. They didn't really help. So I did a lot of research into Igbo spirituality. I went back home to Nigeria before I wrote the book, because I was very nervous about immersing myself in this reality. It was very foreign to me and I was afraid that if I immersed myself in it, I would enter a reality that I wouldn't come out of. I think everyone's centered in their own reality, you know. I think part of the thing that's a problem, really, in the world today is this inability to acknowledge multiple realities, and this insistence that there has to be one dominant reality, and everything that falls outside that reality is false and untrue. And that's how colonialism worked in great part — people came in and enforced a reality and said, "Well, if you believe in anything else, if you believe in your indigenous deities, if you believe in these spiritual entities, then you're ignorant and you're backwards, and it's only because you haven't been educated by the West." And you know, there's this [thought that] everything that is outside the dominant reality becomes something that's pathological. And with my work, I'm not really interested in trying to convince anyone to shift their center, I'm just refusing to shift mine. I have a lot more clarity about things. I also have a clarity around just a multiplicity of being, I think. I had someone ask me after I finished the novel, and they read it, and they were like, "Oh, so when I'm talking to you, which self am I talking to?" And I understood the question, because if — the way it's written in the book, it is that separate. But by the time I was done with the book, and I think something that Ada comes to closer at the end of Freshwater, is an acceptance of what's happening and a bit of, like, she loses that impulse to try and separate it out so much. And for me, now when I think of having a multiple self and what that feels like, I describe it as a boiling cloud. Like that's the image I have for it, is like a cloud of selves that are shifting, and occasionally one or two will precipitate out. But when people ask who they're speaking to, I'm like, "I don't know; it's shifting." I'm not trying to control it anymore. I'm not trying to assign names or separate them. I just allow them to move however they want to move and morph. And yeah, I've learned a lot about surrender since writing the book. Sophia Schmidt and Lauren Hodges produced and edited this interview for broadcast. Sydnee Monday adapted it for the Web.